Cosmogony, the study of the origin of universe, forms part of astrophysics. During nineteenth Century, the Western view of the universe was considerably influenced by Christian theology which held that the world was created in 4004 BC, on a Monday morning. Even after the immensity of cosmogonic time was recognized, the concept of a static and eternal Universe, as conceived by Ptolemy and amended by Newton, prevailed among Western scientists and rationalists. Einestein also subscribed to the theory of "closed universe" initially and calculated the radius of static universe as about 35 billion light years. In early 1920s, Edwin Hubble discovered that the spectral lines of distant galaxies showed a shift towards the red. They theorized that the ‘red shift’ meant that the distant galaxies were receding faster than those galaxies nearer to our system. This led to the concept of an expanding universe and “Big Bang” theory. 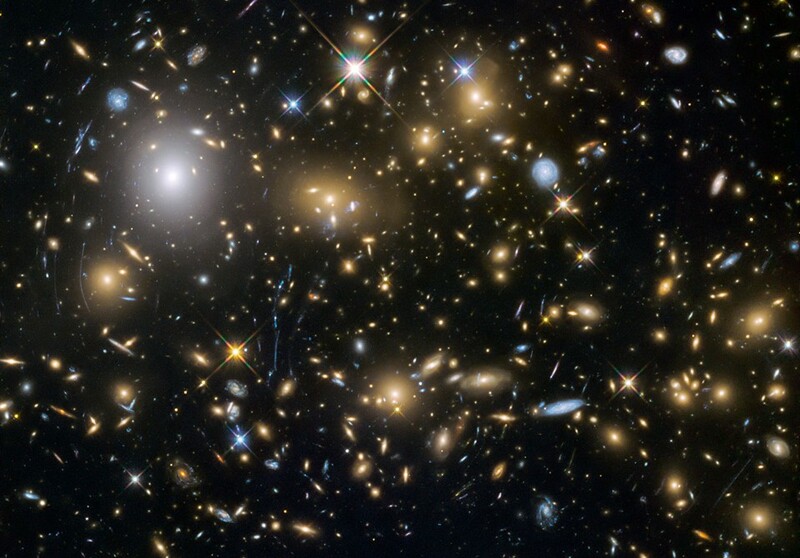 As per this theory, the universe had its origin after a ‘Big Bang’ and is undergoing continual expansion. Big Bang does not mean an explosion, but the phrase is used to indicate the sudden origin with a bang as it were from nowhere and the fast expansion in a staggering scale thereafter. Origin of universe is stated as from nowhere as nobody knows or can know anything about that point of origin; for at that point, if it can be so called, there was nothing; no time, no space, no matter and no energy. As our thoughts, words and concepts all function in a frame of time and space, this point of Big Bang, is beyond comprehension or description. So this state of infinite density and of infinite energy out of which all the origin and expansion had started 13.8 billion years ago, is spoken of as “point of singularity” by Roger Penrose, English mathematical physicist. Singularities are zones which defy our current understanding of physics. This theory postulated not only a beginning after a ‘Big Bang’ in the remote past, but also an eventual collapse in a ‘Big Crunch’ in some distant future. We have a term in Sanskrit, for a state that defies description; which is ‘Anirvachaniya’, meaning that which cannot be spelt out in words. And this is the term used by Advaita Vedanta, to describe ‘Maya’, the power of Brahman, the Supreme Being. Brahman is the Supreme Being with its inseparable, indescribable power called Maya and is commonly referred to as God in religious literatures. Bhagavat Gita describes Maya as made up of three gunas, Satva, Rajas, and Tamas. Generally speaking, Satva is the quality of tranquility and wisdom; Rajas one of dynamism and action; and Tamas of inertia and sloth. When the gunas are in equilibrium, universe is in an unmanifest state (Avyaktha) in Maya. When the equilibrium is disturbed, creation happens. Maya is also described as one that can make things happen without a cause i.e. Aghatana Ghatana Patiyasi Maya. It is through this Maya, Brahman projects the Universe in creation. When we compare this concept of Maya with the concept of the point of singularity, we find a few striking similarities. Both are Anirvachaniya, unexplainable. We can guess their existence but we do not exactly know what they are, and how they function. The upset of the equilibrium of three Gunas is one comparable to Big Bang when creation starts. The state of Big Crunch is comparable to the pralaya i.e. deluge, of Indian Philosophy, when again all the manifested things in creation go back to their unmanifest state, Avyaktha. As per Indian philosophy this cycle goes through eternity, in cycles of shristi i.e. creation and pralaya over a period measured in kalpas. A kalpa is a period of time equal to 4.32 billion earth years. Astrophysics has now a theory similar to that. Lincoln Barnett in his book “The Universe and Dr.Einstein” says “the universe in this picture is like a balloon in which cycles of expansion and contraction succeed each other through eternity”. Both Maya and the point of singularity are not sentient. Intelligence evolves after creation, as per science and so at the point of singularity sentience is not there. And Maya being only the power of sentient Brahman is also insentient. If the knowledge of Brahman, the undivided and all-pervading consciousness, could be gained by Rishis, it was in the intuitive mystic spiritual way, which is possible only for a highly refined mind, and not through the physical processes of the enquiry. Swami Vivekananda says “The mind can exist on a still higher plane, the superconscious. When the mind has attained that state which is called Samadhi-perfect concentration, super consciousness- it goes beyond the limit of reason, comes face to face with facts which no instinct or reason can never know”. It is at the superconscious level that man feels himself identified with the Self within, Athma, which is also the all-pervading consciousness, Brahman. Insight gained in the state of superconsciousness does not contradict reason but fulfills it. Intuition is no stranger to science or scientists. Stephen Hawking worked mostly by intuition in his work on Black Holes. Black Holes are the term applied to super dense stars that collapse as a result of their own gravitational forces. Michael Harwood writing about Hawking’s theory on black holes says “key overview ideas came to him as ‘spiritual revelations’ and make him one of the greatest physicists of our age”. This state is called Chitta Ekagratha, stage of one-pointedness of mind. This state which they attain is similar to the state of savikalpa Samadhi described in Patanjali’s Yoga Sutra. At this stage personal consciousness is not lost and the distinction between the one who meditates, the object of meditation and the process of meditation called triputi is not lost. In the state of super consciousness, even the personal consciousness is lost and only the object of concentration remains. This is the state of Nirvikalpa Samadhi, where there is oneness with the object of meditation and no triputi, described in Patanjali’s Yoga Sutra. It is in this state of superconsciousness, the Vedic Sages could divine their intuitive insights, to which today’s astrophysics is approximating. Dr.Fritjof Capra, the eminent physicist, remarks in his book “The Tao of Physics”, “that fullness which the Hindus call as Brahman can be the meeting point of the ultra modern physics as well as ultra ancient Upanishadic Philosophy”. Can the meeting point as envisaged by Dr.Capra be reached is a question that may not be answered affirmatively even when the dream of a grand unified theory, started by Einstein and pursued by Hawking and still elusive, a Theory of Everything (T.O.E) is achieved. This theory will integrate into one theory the four separate theories that are required to explain different features of the world; namely theory of gravity, theory of relativity, theory of electro-magnetism and quantum theory. Even when T.O.E. is achieved it may be only a set of mathematical equations that can establish the single source of creation beyond doubt. But we will still be missing the Infinite Intelligence that set this dream in motion in the first instance and that is behind Creation. Beyond Maya or the point of singularity is that Supreme Force and this is not the realm of physics but of metaphysics where not only intuitive intelligence of an individual mind but the subjective experience of individual realization in a state of superconsciousness is the influencing factor. Twentieth century physics has stripped physics of its air of certainty and objectivity in the realm of infinitely small and infinitely big and revealed the inter-connectivity of Space and Time, Mass and Energy. Maybe this century may reveal that all branches of human knowledge including metaphysics are interconnected in the form of Advaita Vedanta. Going strong in your new regime! Congrats. Thanks.